Bev began studying Ayurveda with Vaidya P Vijayan ("Vijay") in Trivandrum, South Kerala in 2001. In India, Vaidya is the title for a traditional Ayurvedic Physician where the knowledge is passed down through the family. Vijay represents the 68th generation of his family and he learnt from his grandfather Tamil Pandit Vaidya Valayunthan Pillai. During 2001-2004, Vijay began teaching Bev his family's Ayurvedic science orally through Tamil poems and it is this science that Bev uses in her Foot Massage and Treatments today. One of Vijay's family's specialisations is the science of Marma and Nadi Systems (a system of energy points and pathways). This particular knowledge allows the practitioner to work in response to an individual's condition with a degree of precision that is unusual amongst Ayurvedic practitioners. To date Bev has been taught 23 of these 'sciences', some 2750 lines of Tamil poetry ! She still visits Vijay annually and discusses findings from working with her own clients and so is able to receive even more in-depth teachings. Bev's study's with Vijay are very much based on the traditional 'Gurukula', or teacher-disciple apprentice system. - the 10 main Nadi Sciences, these sciences describe the precise nadi routes within the body, the marma points associated with each nadi and how the nadi intersects and affects the internal organs and chakras. Each science also explains how and when marma points can become blocked or damaged and the effect this can have on how the body functions or not as the case may be. This knowledge forms the basis of the 'manipulations' that Bev uses in her Massage Treatments - from visible or 'felt' symptoms, 'blocked' energy pathways can be treated. 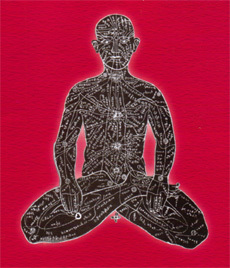 - 4 Sciences All About Marma Points, these particular sciences not only describe the main Treatment Marmas and how to work with marma points to treat people but also describes how the 5 elements (earth, water, fire, air and space) are manifested and seen in certain internal organs of the body and external sense organs, respectively. - Body Treatment Science 100 - Knowledge from the Vaidya's Heart, this long (100 stanza) Tantric science describes the 96 tattwas of the body, defines the different Doshas that people can be (eg Vata, Pitta, Kapha, Vata-Pitta, Kapha-Pitta etc) and how this manifests in a person's body shape, personaility, positive and negative characterisitics. This science goes on to describe how imbalances can occur, for example what happens when say a person of Vata dosha is subjected to 'cooling' or say if Pitta comes to a predominantly Kapha dosha person. This knowledge is used to find the source of a persons' problem and to re-balance the Doshas. - 2 Sciences on Pulse Analysis, these sciences complement the Body Treatment Science 100 as well as teaching about Traditional Ayurvedic Pulse Analysis. These sciences also give more detailed descriptions of how Doshas are affected by the time of day, season etc, where the Doshas reside in the body and, if the Doshas become unbalanced how and when symptoms will be experienced. But most importantly these sciences also describe how to 'treat' a person according to their constitution. - 3 Sciences for Sacrospinalis, Leg and Arm Bending Nerves, Bev uses these 3 sciences almost daily as they are concerned with how and why our spine and limbs do not have a full range of movement and flexibility. At first, the treatments seemed too simple to be true but after years of practising them, what they say is definately true ! - Inside Opening Like a Lotus Flower, this most beautiful science was the one that Vijay initially used on Bev in 2000 to help her on her own journey to self-healing. Today, Bev regularly uses this knowledge and still marvels at it's profoundity on how to unlock Prana and Kundalini. One of the many reasons why people can feel so energized and 'different' after a Treatment. Bev has also broadened her knowledge on Ayurveda by brief periods of study with other Vaidyas and Ayurvedic Doctors. These include, Dr Vasanthy Surendran, Cochin, North Kerela in April 2004, and Dr Kannon, Trivandrum, January to March 2004. With Dr Vasanthy, Bev learnt the 'North Kerala' style of combined Foot and Hand Massage called Vadakkan Murai. However, she no longer practises this form of massage due to the excessive strain it placed on her own body. With Dr Kannon, Bev studied Vagbhata's 'Astanga Hrdayam' - the Classic Indian Ayurvedic College Text. This period of study enabled her to gain an understanding of how much of what is written in the 'West' regarding Ayurveda relates to the more ancient and profound science that she studies with Vijay.